Available in two sizes and in two finishes. Cherry or Maple, each with a natural satin finish.. Due to the nature of wood, patterns and color will vary. Personalization is included as shown. You may choose from Times Roman Bold and/or Times Roman Bold Italic for the engraving (indicate upper and lower case or all upper case). Submit via email to CustomerService@RainbowBridgeUrns.com, two high resolution digital prints with your first and second choice, to be laser-etched onto the urn. Note: Laser etching takes 3 to 4 weeks. 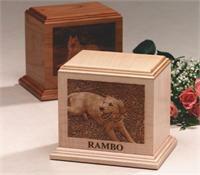 Personalized items are non-returnable, non-refundable. Closure: Bottom-opening base attaches with screws. What type style do you prefer? I was very pleased with the out come of this urn. Seeing my guy picture on the outside of his resting place is big comfort. It would of been easier if the link to upload the pictures was on the page where ordering from emailing them seem to delay the process down by a day. Thank you for your review. Because it is our goal to provide you with the best product available, photos are not directly up loadable as it may degredate it for engraving.